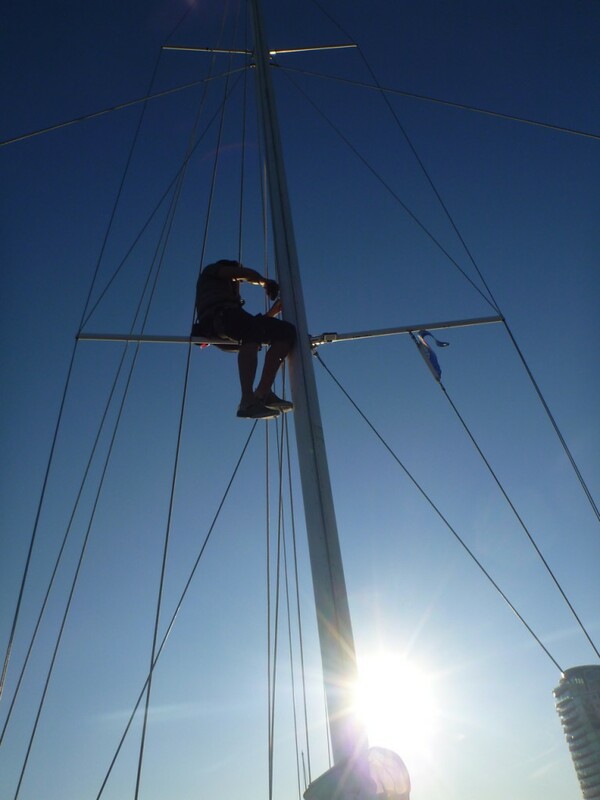 Drew finished installing deck lights today – I cranked him up the mast using the winch, and he perched on the spreader and did the installation. 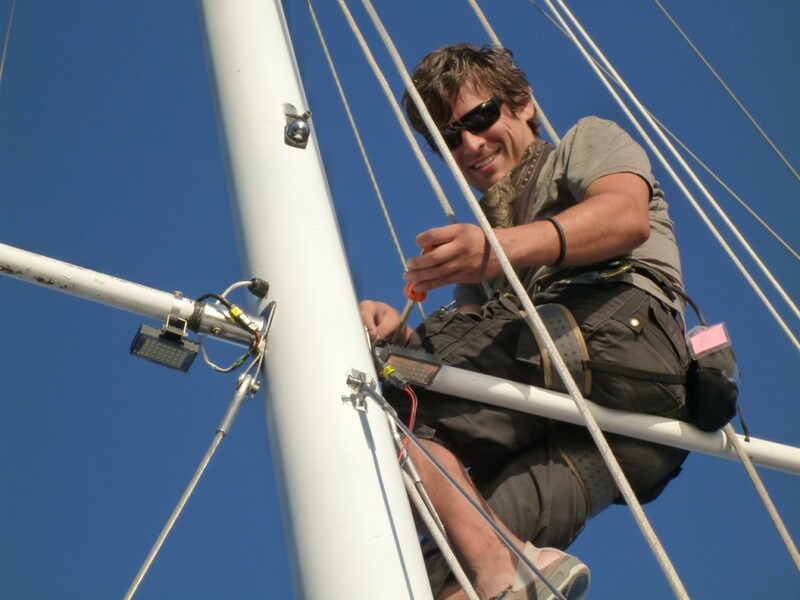 The first time up the mast he forgot the heat shrink tubing. 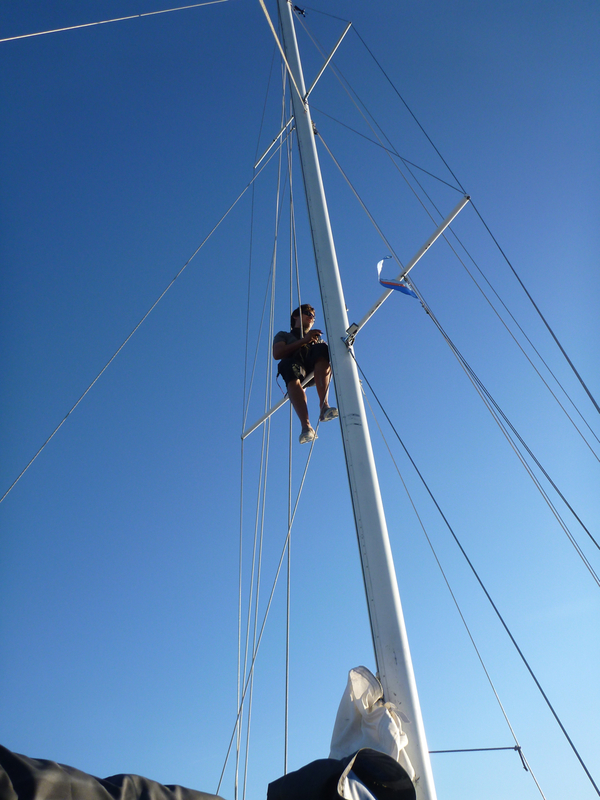 I lowered him down, we located the missing items, and I winched him back up. The second time up he forgot the crimpers. Instead of bringing him back down and then back up, we decided I should just throw the crimpers at him and he would catch them while owling precariously on the spreader. A solid plan. My first toss he came very close to catching…then gravity took over and brought them plummeting back towards my face. My second throw was worse and came nowhere near him, and thank god nowhere near my face, but did come within inches of slamming onto the new solar panels. My third throw, possibly because by now we were both laughing so hard at the absurdity of the situation, flew up over my head, behind me, and into False Creek. Earlier in the morning, Drew had thrown my favorite kitchen knife in the ocean while we were eating breakfast in the bow nets, so ultimately it seemed pretty fair. We had another pair of crimpers but I cleverly realized I could just tie them to another line leading up to the spreaders and ferry them up that way. Its good I came to this realization because shortly after, we realized he also needed the heat gun and a spool of extension cord (and throwing those items up to the spreaders would have likely collapsed into widespread injury and destruction pretty rapidly).